Your kids – and you – are going to love your Gold Coast holiday! Imagine days filled with sunshine, foodie pursuits, and unforgettable experiences, like a trip to INFINITY. We guarantee to be the attraction that will up the fun-factor level for the entire family. Our fantastic fun house of the future, was recently featured in a blog post by Expedia for being one of the must-see Gold Coast attractions that will guarantee an unforgettable family holiday. Check out the article, ‘Gold Coast Family Holidays‘, for more inspiration on a fuss-free family holiday. Stunning special effects, mind-bending illusions, immersive art, and evocative sound fields ? you and your family will literally feel like you’ve stepped beyond reality and into the excitement, serenity and elation of Infinity. It is a multi-sensual and multi-emotional journey that has to be experienced first-hand in order to truly understand. Located in Surfers Paradise, you can plan your day around your INFINITY voyage. Be prepared to be completely wowed when you to step into the wonder of our fun house that opens up to a whole new world of imagination and creativity for you and your kids. Experience our Electron Maze, Star Chamber, Glow Tubes, Time Tunnel, and of course, the Cyclotron. Sounds intriguing, doesn’t it? 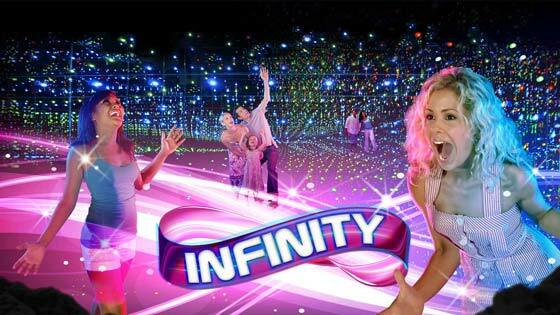 Visitors to INFINITY always rave about the experience. Our most common testimonial is always along the lines of you cant describe it you have to experience it! So what are you waiting for? Book your flights to the entertainment capital of Queensland and check in for a day of fun. As Expedia says, your ‘kids will love having the freedom to find their way through the different interactive zones – you might even find yourself letting your inner child go wild.’ There really is nothing more bonding for families than creating fun memories together, letting go of your inhibitions and having a good laugh along the way. We specialise in creating memories and that’s why we love to host kids parties. While you relax knowing everyone is safe and having a good time, your kids will get to mind warp into the innovative immersive environments for the ultimate party experience. Whether its for a birthday or any reason at all, its guaranteed to bring a smile to the faces of everyone invited! We look forward to seeing you at Infinity on your next family holiday to the Gold Coast!